Reviewing Authority's Recommendations: 1. 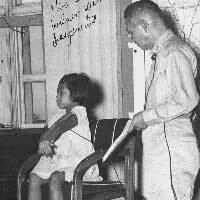 Based on Ishige's immediate superior's testimony, all that is needed to show superior responsibility is that the acts took place in the camp (strict liability). But, the reviewer finds that "enough offenses were proved to establish constructive notice to Ishige." Furthermore, as an officer, it does not matter whether the crimes were of omission or commission. He also did nothing to enforce his order - "it is a basic military principle that an officer...should not give an order the enforcement of which he cannot insure. 2. Reviewer states that the defense amounts to mere a denial of all charges. 3. Reviewer and those above believed sentences to be too light. Paul E. Spurlock, Reviewer, Judge Advocate Section 1. Gave warnings to the guards not to punish prisoners. Told guards to treat prisoners kindly. 2. Made announcement to the company that prisoners were not to be mistreated. 3. Only several instances of beating was reported to him. 4. Certain POWs were punished but not struck for offenses committed. As to Spec. 1, it is an interesting issue brought up. The accused stated that he "could no nothing because the prisoner had been transferred to Nippon Steel Mill" when it was asked that a POW named McEwen be given medical treatment. Spec. 3f and Spec. 7 for Kondo involve incidents at the Nippon Kokan Steel Company. Kondo is said to be one of the beaters. Is this why the accused is deemed responsible? Defense Arguments: 1. Superior Orders 2. False identification 3. Denied abuse and mistreatment of POWs.